Bachmann has released images of the exciting new Wickham Trolley model in its Branchline range. 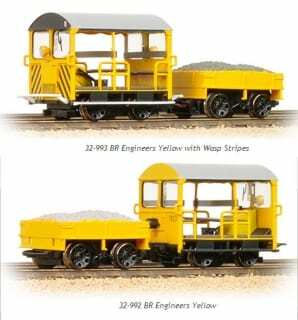 Revealed to modellers at the recent Warley Model Railway Show Bachmann has now provided images of the latest livery samples for the Wickham Trolley Cars in 4mm scale/OO gauge. The Wickham Trolley was introduced in 1948 and was a railway engineering personnel carrier. They were supplied to many countries in narrow, standard and broad gauges. These finely-detailed models come with many features including a permanently coupled trailer with electrical pick-up, 2 radiator types and correct pattern wheels. The Bachmann models represent the Type 27 variant of the Wickham Trolley Car, used by permanent way gangs countrywide. Three models are being produced: BR Maroon (Cat Ref. 32-991), BR Engineers Yellow (Cat Ref. 32-992) and BR Engineers Yellow with Wasp Stripes (Cat Ref. 32-993). The models are due in March/April and will sport and RRP of £79.95.